Getting sick while looking after a baby is the pits! 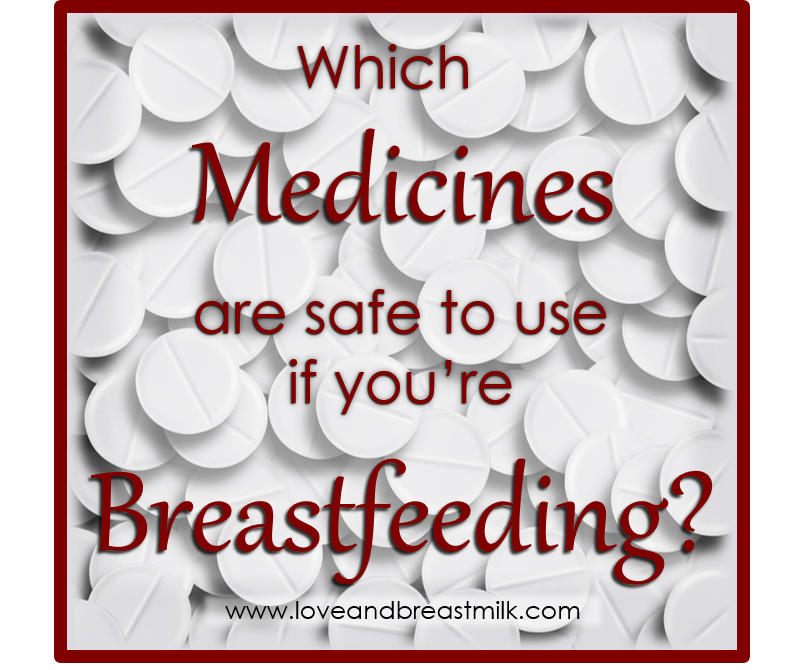 And as a breastfeeding mother, you are then confronted with another conundrum: is it safe to take this medication while I am breastfeeding? Will it harm my baby? Will it affect my milk supply? In this post I will look at medication use while breastfeeding in some detail, give you some guidelines on commonly used medications, and show you where to find the information for the rest. How does medication get into breast milk? First, the medication must be absorbed from the gut into the blood stream. Some medicines, such as most laxatives, aren’t absorbed at all, so they won’t get into your blood and thus not into your milk either. Next, the blood that is absorbed from the gut passes through the liver. The liver metabolises and eliminates quite a lot of the active ingredients during this “first pass”, which is why the actual blood level of a drug is usually lower than what simple maths would predict. Finally, the medication needs to move from the blood, through the cells of the milk glands and into the milk. Many medication molecules cannot actually do this, because of certain chemical and physical properties. On the other hand, a few medicines love breast milk, and you’ll actually end up with higher levels in your milk than in your blood. This makes it impossible to predict what a new medication will do: until someone has actually measured the milk levels of a medicine, we just don’t know how much your baby will ingest. Luckily, a lot of this research has already been done. Of course, the final step is that baby has to drink the milk that contains the medicine. Because the amount of milk that baby drinks is such a small percentage of the total volume of blood into which the medicine was mixed in the first place, the dose is usually very small. Some medications can also be ingested by baby, but not absorbed in his gut (for example, some antibiotics need to be injected because they are not absorbed by the gut. In that case, the medication would reach baby’s gut, but would not be absorbed into baby’s blood). Important disclaimer: I am not a doctor or pharmacist, and I am not qualified to prescribe or dispense medication. This is simply a summary of the best available research on this topic. Good news: the vast majority of antibiotics are safe in breastfeeding. The most commonly used antibiotics, penicillins and cephalosporins, have all been studied and shown to produce very low milk levels. Most of the other antibiotic classes that have been studied have also been found not to produce significant milk levels. There are only two antibiotics to be aware of: Firstly, doxycycline or tetracycline, when used for longer periods, can cause staining of baby’s teeth and reduce bone growth (short term use is okay; it’s when the medicine is used chronically – e.g. to treat acne – that problems occur). Secondly, if metronidazole is given in very high doses (2 grams), it can produce high milk levels – it may be wise to avoid breastfeeding for 12-24 hours afterwards. However, metronidazole is safe to use in infants over a year old, and the dose from breast milk is far lower than the infant therapeutic dose; so if baby is over a year old there is no need for concern. Topical metronidazole, e.g. vaginal creams, are not absorbed into the blood in any significant amount. If you need an antibiotic, it may be wise to ask your doctor to prescribe something that your baby could also safely take at his age. That way, you know that even the small amounts that are excreted in your milk will not be harmful. Always remember that antibiotics increase your risk for thrush, so be sure to take a good probiotic. Antibiotics can also cause stomach upsets in you or baby – a good probiotic will help to limit or prevent this. Probably the best painkiller to use while breastfeeding is ibuprofen, since the amount transferred to you milk is extremely small. Similarly, paracetamol is also secreted into milk in only very small amounts. Diclofenac, which is often prescribed for more severe pain and inflammation, also reaches very low levels in milk. It is probably best to choose from these three for pain management. Codeine is found in some mixed pain medications. Most babies tolerate codeine well, but there have been cases where infants have been sedated or stopped breathing after mom used codeine (although in these cases it was in higher doses than what you would find in a mixed painkiller). Codeine-containing painkillers are widely used to manage post-birth pain and complications are rare. It would be wise to avoid pure codeine in high doses, and to avoid it if your baby is premature or has other medical problems. Also watch baby very closely for sedation. Aspirin is one painkiller that should be avoided, not only by breastfeeding women but by all babies and children under the age of 12. It is associated with a serious condition called Reye’s syndrome if ingested by a child with a viral illness (however, this has never been reported from aspirin in breast milk). Aspirin levels in breastmilk are quite low. For pain management it would be better to use one of the safer painkillers. However, if you need to take low-dose aspirin for blood clotting or cardiovascular disease, the risk may be low enough that you can continue – talk to a lactation consultant about your specific case. If you are seeing a psychiatrist (not just a GP), they should have a pretty good idea of what is safe to use during breastfeeding. It’s important to know that the use of psychiatric medicines is seldom a reason to stop breastfeeding, as there are medicines in almost every class that are safe to use. Of the antidepressants, SSRI’s are preferred. In this class, sertraline and paroxetine appear to be the safest, with very low milk levels and no adverse effects reported in breastfeeding babies. Citalopram also produces low milk levels and most studies show no adverse effects, but there has been one case where a baby became sleepy while mother was taking citalopram. Fluoxetine is less preferred, as there are several reports of infants developing colic and some concerns about reduced weight gain – if fluoxetine is used, it should be limited to mothers of older infants, and only used in low doses. Sedatives should be used with caution, as they may cause sedation in the baby, especially with high doses or long term use. The benzodiazepines (diazepam, midazolam, lorazepam) all produce low levels in milk and are probably safe for short term use, although the baby should be monitored for sedation. For the treatment of bipolar disorder, valproic acid is preferred over lithium. Lithium reaches relatively high levels in breast milk and there are concerns over infant toxicity. In contrast, the transfer of valproic acid into breast milk is low. Antipsychotics are another type of psychiatric drug that must be approached with caution. There have been reports of sedation, sleep apnoea (where baby stops breathing) and SIDS with the use of older phenothiazine antipsychotics (e.g. prochlorperazine, chlorpromazine). Other antipsychotics, including haloperidol, risperidone and olanzapine, are considered safer, as milk levels are low and no side effects have been noted in breastfed infants. Sulpiride is an antipsychotic commonly used in breastfeeding mothers, since it has the side effect of increasing prolactin levels and therefore potentially increasing milk production. It transfers to milk in only low levels and has not been known to produce side effects in breastfed infants. Congestion: AVIOD using any medication with pseudoephedrine; it is known to cause a drop in milk supply, especially later in lactation. Nasal sprays containing oxymetazoline or xylometazoline are effective and safe. Runny nose and eyes: Antihistamines should be used with caution. There are some reports that it may decrease milk production, but it is not a consistent finding in the research. Newer, non-sedating antihistamines have a good track record so far. Cortisone and prednisolone: these do not transfer well into breast milk, so a short course taken while you have flu is unlikely to do any harm. Of course, remember all the non-medicinal measures that you can take: honey and lemon juice to soothe a sore throat and ease coughing, saline nasal spray to clear mucus, essential oils on a tissue to help ease breathing and, most importantly, lots of rest! Constipation: Laxatives are generally not absorbed into the blood, and are therefore safe to use. If in doubt, your pharmacist can recommend one for you. Diarrhoea: Loperamide has very poor absorption from the gut, so only very tiny amounts can get into the blood and breast milk; it is considered safe to use. Nausea and vomiting: Two anti-vomiting medications, metoclopramide and domperidone, are commonly used to increase milk supply, so they are a good choice. Cyclizine also seems to produce only low levels in milk, and it is commonly used during pregnancy, so it is unlikely to harm the baby. Insulin is completely safe to use during breastfeeding: because it is a very large molecule, it does not pass into breast milk at all (and even if it did, it would be destroyed by the baby’s stomach acids before it could be absorbed). Metformin is considered an excellent medication to use while breastfeeding: it is transferred to milk in minimal amounts – in fact, it is usually completely undetectable – and no adverse effects have been reported in any breastfeeding infants. The concern with anti-hypertension medication is that it could cause low blood pressure and/or decreased heart rate in the baby. Certain beta-blockers (atenolol, acebutalol) have been reported to do this. ACE inhibitors should also be avoided for the first few weeks after birth, for the same reason. Nifedipine and verapamil, two calcium channel blockers, have been shown to produce low milk levels. The anti-hypertensives that are used during pregnancy, such as methyldopa and hydralazine, also appear to be safe to use during breastfeeding. Diuretics, such as furosemide and thiazide/HCTZ, may cause a drop in milk supply, so they are best avoided. It is very important to let your health care provider know that you are breastfeeding when you discuss contraception. Certain contraceptives, especially those containing estrogens, can reduce your milk supply (this would include any normal “pill”, where there is one week of tablets that differs from the rest). Of the hormonal contraceptives, those containing only progestins are the least likely to have an impact on your milk supply. They include the “minipill”, injections, implants and intrauterine device. A few women do experience a drop in supply when using progestins, though, so to be safe it may be a good idea to try the minipill first – at least you can stop it immediately if it doesn’t work out for you. Of course, there are a number of non-hormonal contraceptive methods that are also safe, but that’s a story for another day! But the package insert says “do not use during lactation”! If you look closely, you will find that almost every single medication says that it should not be used in breastfeeding – even the ones known to be safe. Why is this? It is simply because the pharmaceutical firms only use information from large clinical trials when they are compiling their pamphlets, and they cannot do large clinical trials on breastfeeding women. Additionally, they are afraid of being sued if something happens to a breastfeeding baby when the mother is taking the medication, so they rather take the safe route of saying that it should be avoided. Don’t use the package inserts to tell you when a medicine is safe for breastfeeding; they’re often wrong. Which medicines should I avoid? Pseudoephedrine – found in many cold and flu medicines. Estrogens, found in certain birth control pills. Dopamine agonists such as bromocriptine, ergotamine and cabergoline (aka Dostinex, the pill that they give you to dry up your milk if you don’t want to breastfeed). Very high dose vitamin B6. Immunosuppressant medications, such as the ones that may be used to prevent tissue rejection after organ transplant. A few random medications that have shown significant side effects in babies: amiodarone, chloramphenicol, doxepin, lithium and tetracycline/doxycycline when used for more than 3 weeks. Some of these medicines require a period of pumping and dumping, while others require complete weaning – a lactation consultant or La Leche League leader will be able to help you with more information. Lactmed allows you to search for information on a wide variety of medicines. You can use their website (here) or download their free app onto your smartphone. The Infant Risk Center is run by Dr Thomas Hale, who is generally considered to be the expert on the matter of medicine use in breastfeeding. There is some information on their website, and you can also look at the questions asked and answered in the forums (or even ask a question – they answer very quickly). They also have an app that you can download; it is not free, but it is a fantastic resource. E-lactancia is another fantastic website (here). You can search for info on thousands of medicines, herbs, cosmetics, chemicals, diseases and other things. If you prefer the human touch, your local lactation consultant or La Leche League leader should also be able to help you. Just don’t rely on what a doctor or pharmacist tells you; most of them are not even aware of the research concerning medication and breastfeeding, so they will often tell you that you can’t take a medication that is in fact safe. I sincerely hope that you never have to struggle with illness while you are breastfeeding – but at least, if you do, you are now armed with a lot of useful information!